- The cage assemblies comprise axial cages and one or two rows of cylindrical rollers. The diameter series 1, 2, 3, 4 correspond to DIN 616/ISO 104. - The cages are made from plastic or brass and are guided as standard on the shaft. - The cage assemblies have very low axial section height and high load carrying capacity. They can support axial forces in one direction. Radial forces must be supported by separate means. - Axial cage assemblies are combined with shaft or housing locating washers or are integrated directly in the adjacent construction. 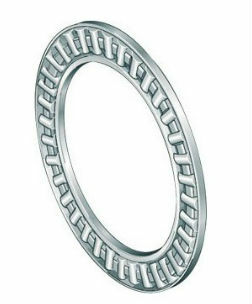 If they are used without axial bearing washers, the raceway must be produced as a rolling bearing raceway.